PowerLine networking, also known as Home Plug technology, transmits data on the existing electrical wiring in your home and does not require any new network cables. It is ideal for connecting home network entertainment components normally located near a power outlet. Any Ethernet-ready devices, such as Broadband routers, computers, HD TV, digital video recorders, game consoles, Internet cameras and print servers can be added to a home network using PowerLine technology. 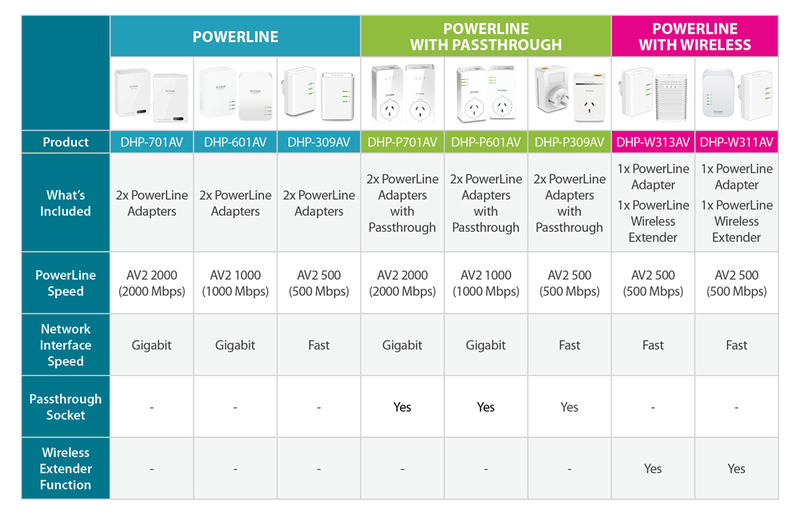 All of the D-Link PowerLine AV product range comply with the HomePlug AV or AV2 standard. Your home is already wired to take advantage of PowerLine. Take your entertainment center or game room to the next level with incredible speeds up to 2000Mbps. MIMO technology lets you transfer more data via multiple streams so you can do more of the stuff you love like streaming and gaming. It also filters out noisy signals, delivering a strong and reliable signal to devices without interference. Boost Wi-Fi signal to areas of your home with no coverage. It can drag down your network performance since it shares the bandwidth with the router. Extend Wi-Fi Coverage to hard-to-reach areas of your home using your homes existing electrical wiring. It won't share the bandwidth with your router so you'll get a stronger signal.